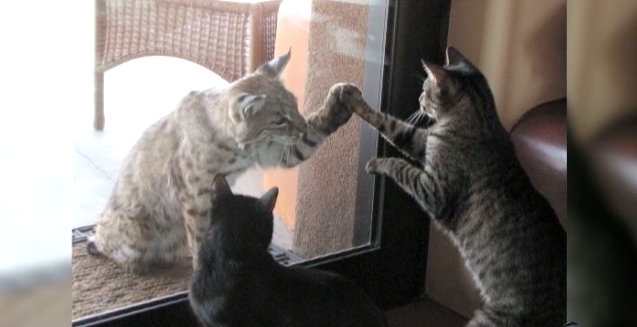 A bobcat and a house cat in Arizona tried to touch paws through a glass door. If you see a bobcat near your home, there is no need to panic. Bobcats rarely attack people. However, if a bobcat does attack a human, it generally will have symptoms of rabies. Bobcats may be attracted to a yard that has abundant wildlife, domestic birds, small pets, water, and shade or other shelter. Small pets need to be protected from bobcats and other predators. Keep small pets indoors, in an enclosed area with a roof, or on a leash when outside. Domestic birds should be kept in an enclosed area with a sturdy roof (a 6-foot tall fence is not necessarily good protection), and do not spread seed that attracts other wildlife. Do not feed bobcats, as this can encourage them to become too comfortable around humans. Bobcats may visit an area to find food, water, shelter, or the space they need to live. Food may include birds, rodents, rabbits, small unattended pets, poultry or other domestic birds, and other small livestock. Water in pools, birdbaths, fountains, and pets' water dishes can attract bobcats. They will sometimes defecate in shallow water (such as pools and fountains). Responses to "Bobcat and Cat Meet Their Match (VIDEO)"
Where in arizonia was this? Bobby liiks like it's sizing up dinner....LoLz!